Do you have a new puppy joining your family? It’s an exciting event, and being well-prepared for the newcomer will make the homecoming a great experience for everyone. So what you should get for your new family member? While there are an endless array of wonderful puppy products, it is best to start with the basics and build up from there as and when required. A puppy collar and a leash are necessary for taking your puppy out for walks. Attach an identification tag to the collar to be on the safe side in case your puppy ever wanders off and gets lost. You can get a short or long leash, depending on your preference. As the puppy grows, you will need to upgrade to a larger-sized collar and a stronger leash. Stainless steel or ceramic bowls are durable and easy to clean, and heavy enough to prevent the puppy from overturning them and making a mess. Get regular sized ones that you can continue to use as the puppy grows up. A crate is useful for keeping your puppy confined, while you are too busy to keep an eye on them. As dogs dislike soiling their sleeping area, the crate will also help with potty-training your puppy. Accustoming your pet to a crate will make long-distance travel easier for them. Get a large crate if your puppy is a large breed. The crate should be spacious enough for your growing puppy to sit up in, and they should be able to stand and turn around with ease. 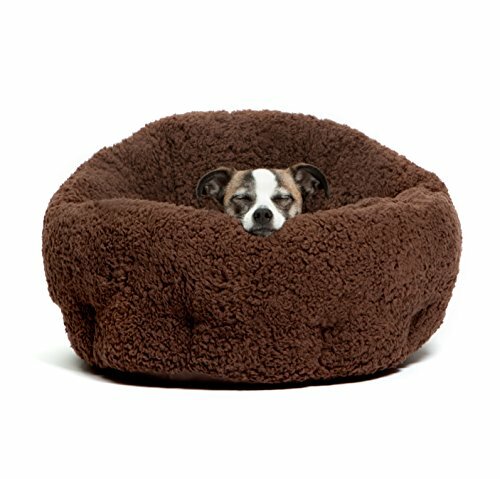 Your puppy will appreciate a warm, comfortable dog bed to snuggle in. Get a nice-sized one that your puppy can still use as they get bigger. Make sure the bed is durable and easy to clean, and made of non-toxic materials. A teething puppy will chew at anything in sight, including your hands and legs. Chew toys will prove a welcome distraction and keep you, your footwear, and your furniture safe. Make sure the chew toys are non-toxic and your puppy can’t accidentally swallow any parts of them. These noisy toys will keep your puppy interested and entertained, and they are good for snuggling against to make the puppy feel safe and comforted. You can also use these toys to teach your pet to fetch. You are going to need to wash your puppy at some point, especially after muddy walks or play sessions. Keep a mild dog shampoo at hand and accustom your puppy to regular baths. Brushing your puppy is a must to keep both them and your home clean and tidy. It will also get your puppy used to being handled, and help you bond better. Be calm and gentle as you brush them, so they enjoy the experience. Puppy nails can be painful to endure and are best clipped if they get long. Train your puppy to have their nails clipped from an early age. Take all the time you need to do this and be very careful to not injure the puppy. If you are unsure about doing this yourself, get the nails clipped by a vet or a professional dog groomer. Get books and videos on training your puppy. Look up dog training articles, videos, and other information online. You need to know what to expect from your puppy, how to interact with them, and how to communicate with them so that you can live well together. It can take a couple of days for the puppy to stop missing their mother and get used to their new parents. Cuddle the puppy and talk to them as much as you can. Repeat their name so they understand that this is what they are called. The puppy’s collar should be a snug fit. Insert two fingers between the collar and the puppy’s neck to ensure the collar is not too tight. If you are going to use a crate, don’t keep the puppy confined in it for longer than twenty minutes. Place the crate in the area where you are working so that the puppy can see you and be reassured that they are not alone. Put toys in the crate to keep the puppy distracted. Feed the puppy at set times, two to four times a day. Some people like to keep the food bowl filled and let the puppy graze at will, but puppies don’t have self-control and are more likely to gobble everything at one go and get sick later. Keeping food around may also encourage rats and other pests. You also don’t want your puppy to end up inside the food bowl, so keep a watch as they eat. Make sure the water bowl is filled at all times, so that your puppy doesn’t go thirsty. Puppies sleep a lot, so the dog bed will get a lot of mileage. Make sure your puppy doesn’t chew and swallow any of the bedding material. In such a case, retire the bed and make do with a blanket until the puppy is done teething. If you see the puppy nosing about the ground, they probably want to relieve themselves. Take the puppy out at once, and also after every meal and nap. The puppy will soon understand that they need to go outside for peeing and pooping. This can take time, so be patient and don’t lose your cool when accidents happen inside the house. Make sure you puppy-proof your house. Tape shut any electrical outlets that your puppy can reach. Keep wires and all other items that you don’t want chewed off the floor and out of reach of your puppy. Install puppy gates at the bottom of stairs or in doorways to keep your puppy from going into areas you don’t want them to go to. 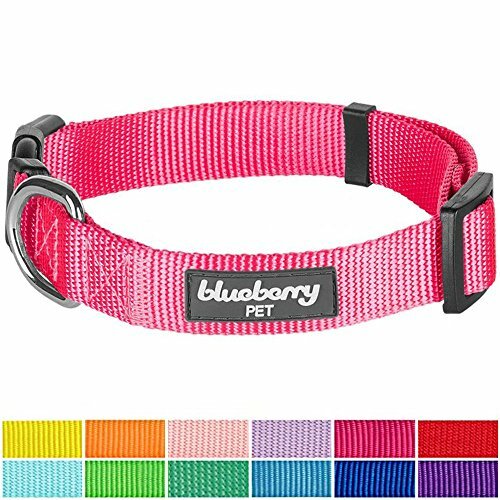 Made from nylon, with a plastic buckle and a metal D ring for the leash, this durable collar is available in a range of colors. The collar is washable. 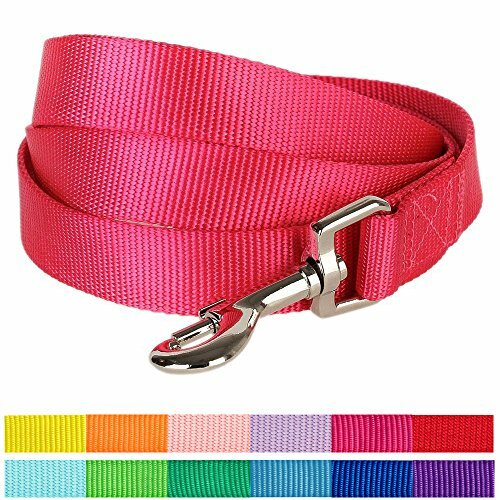 Recommended for puppies and medium-sized dogs, this 5 feet long leash is made of durable nylon, has a sturdy clip, and is washable. You can get it in different colors to match the collar. Your puppy will love snuggling in this cozy bed. Made from non-toxic material, it comes in different colors to match your house decor. The bed is easy to clean and has a waterproof mattress bottom that will protect your floor from any messes. 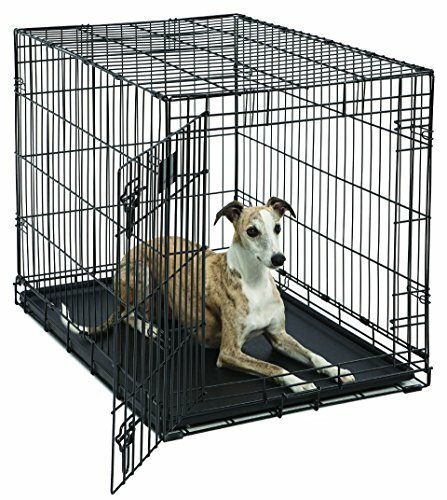 This sturdy metal crate can be collapsed flat for traveling or storage, and modified to accommodate your growing dog. The door has a solid bolt and there is a carrying handle. The plastic pan at the bottom is leak-proof and there is a removable divider panel. 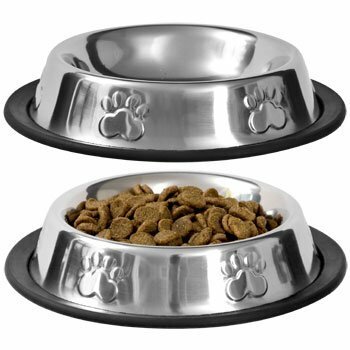 These steel bowls are durable, chew-proof, and your puppy won’t be able to overturn them too easily. The bowls have rubber bottoms that prevent them from skidding around on the floor. They are also easy to wash and keep clean. The good-looking brush has fine bristles that are good for untangling matted hair and keeping your pup’s fur in good condition. They are durable and easy to clean. The wooden body of the brush has an easy to grip handle. 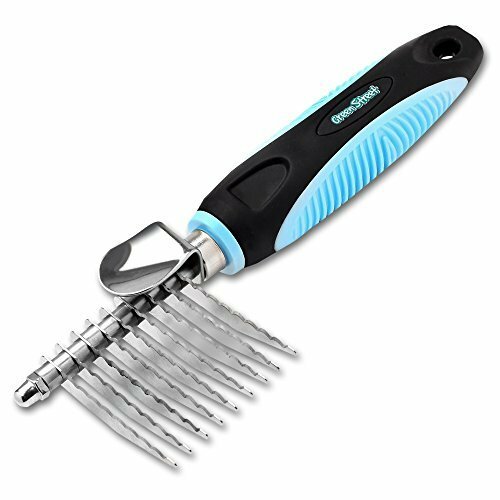 This is quite an excellent comb with round-tipped teeth that are easy on your puppy’s coat. It is useful for removing shedded hair, mated hair, and any knots in the fur. The comb handle provides a good grip during grooming. 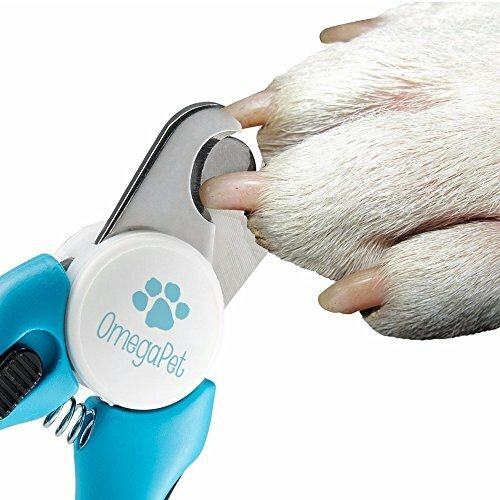 These stainless steel dog nail clippers are sturdy, come with non-slip handles, and are easy to use. There is a quick safe guard to prevent over-cutting. A nail file is included for trimming the nails. Your puppy will enjoy chewing on these durable, food-flavored nylon bones. According to the manufacturer, chewing these bones will distract dogs from destructive behavior around the house, and will also help keep the canine teeth clean. 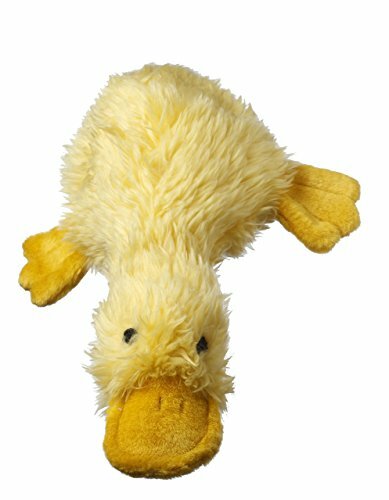 This squeaky, plush duck will arouse the puppy’s curiosity. Keep an eye on your puppy while they are playing. If the toy gets torn or damaged, remove it to prevent your puppy from swallowing the parts. While it is good to be prepared for your new pet, there is no need to go overboard with your budget. Puppy products come in a range of affordable prices. You can also re-purpose and reuse items you already have in your house. The important thing is to shower care and attention on your new puppy. Talk to them and play with them as often as possible. Train your puppy to become a good canine citizen that is a joy to you and your neighbors as well.